I'm so happy to announce a wonderful giveaway from Fort Worth Fabric Studio! Meet the "Orange Berry Bebop" bundle...a darling bundle made up of 13 prints that pack a punch of color! This bundle is made up of prints from the Free Spirit "Pretty Little Things" collection paired with other top picks to make a bundle that presents a vibrant dance of color! For one entry visit Fort Worth Fabric Studio, then come back and leave a comment mentioning your favorite collection or bundle. For another entry "Like" Fort Worth Fabric Studio on Facebook, then come back and leave a comment mentioning you did that. (If you don't have a Facebook account, you can sign up for their newsletter instead). Thanks so much for stopping by...Good Luck! EDIT: Congrats to LynCC...I'll be e-mailing you! Citron & Gray Colorstory by Michael Miller! I love the Quiltcon Challenge fat quarter bundle and the aqua/red bundle. Great fabric! I've signed up for the newsletter. Love the bright color choices and name too! My favourite bundle is the Ta Dot bundle, but Luminosity is a close second. I'm loving the ombré dots right now! Oh I love Owl be there very much! I already get their news letter. Thanks so much! I think the Michael Miller Aqua and Red collection is lovely. They are my colours! I liked Fort Worth Fabric Studio on Facebook. Thanks for the giveaway! I have ordered from FWFS before and I love their fast shipping and the extra special goodies they included with my order. My favorite thing right now is the Fishing For Love pocket pack. I have also liked Fort Worth Fabric Studio on Facebook. Love Berry Bebop but Citrus Twist is just as nice. I like the Redwork Lazy Daisy Baskets. I already get Fort Worth Newsletter. Ok, I've been trying to figure out what to use the Star Wars by Camelot Cottons for awhile that they carry - something for my husband but I just haven't found the perfect thing yet, but Christmas is coming fast! What a gorgeous bundle. I love the Apple Sauce fat quarter bundle. Thanks for the great giveaway. I am a newsletter subscriber of their shop, thank you for the giveaway! I like the 1930's Playtime! Thanks! I'm really digging Pretty Little Things by Free Spirit. Gosh, it is hard to decide :-) Alexander Henry Novelties would be my choice. I like the Citrus Twist. I have also signed up for their newsletter. Kona FQ bundle .... so versatile! The Riley Blake Ombre dots would make great bindings! I like Fort Worth on Facebook! I like the fresh collours off this fabrics most , and of course I like to try my luck in the give away. Greetings Jud. Ohhh I love the Summer Color Study 1 bundle! Great colors! Retro Kitchen - so cute! I'm thinking ahead to Christmas: I like the Jingle fabrics by Robert Kaufman. I already receive the FWFS newsletter. I've signed up for the newsletter. Thanks. I really like Tweet by Timeless Treasures. Am seriously tempted by their fat quarter bundle of It's a boy thing... Rare to find something so suited to my godson. I like the aqua red bundle, but what a choice !! I' ve signed up for the newsletter. I love Tippy Toes by Henry Glass, and Nostalgia by Exclusively Quilters is great for baby quilts - lovely website. Have signed up for the Newsletter too! 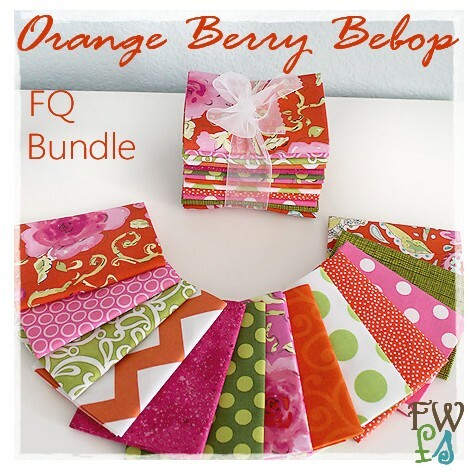 I seriously love the Perfectly Perched FQ bundle. 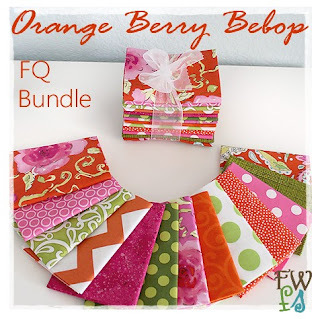 I like the Citrus Twist FQ bundle. I "liked" Fort Worth Fabric Studio on Facebook. I love the Summer Color Study 1 bundle. Amazing colors! Thank you for the opportunity! I love the QuiltCon Challenge FQ bundle. I'm drooling over the giveaway bundle too! I'm signed up for the FWFS newsletter. I liked them on facebook, and I really DO like Fort Worth Fabric Studio. I order from them frequently and they are fast at shipping let me tell you for sure.! I love the Alexander Miller's Zhivago collection! I liked the Fort Worth Fabric Studio on Facebook. That "Pretty Little Things" piece on the end really caught my eye, so I went to Fort Worth Studio and ogled all of that line. Lovely! I like the "All Suited Up" bundle. But it is hard to just pick one. I like the Quilt Con Challenge bundle. Thanks for highlighting this fabric shop, Sherry. I like the mix of fabrics there, and, of course, love the bundles. I just signed up to receive Fort Worth Studio's newsletter, and I have favorite placed them in my computer! I will definitely visit there often!! I signed up for their newsletter - will be great to se more updates from them. Soo many cute bundles... The 'Sorbet' definately catched my eyes but 'Orange Berry Bebop' is just as perfect. Too hard to pick just one favorite! OK, now you are just an enabler. I love Applesauce and have ordered a bundle to add to my FW block fabrics. Thanks for the chance to win. I love the Ta Dots! Gingerbread Houses really got to me! Thanks for the giveaway! I like Zhivago! But they all look fabulous! Thanks for the chance to win. Beautiful fabric collection! I like Run Robot Run....so cute! I already receive their newsletter. Thanks for the giveaway! oooo - I love that Christmas Time with the Charlie Brown characters! And I've got them Liked. The ombre dot bundle is calling my name! I love the summer color study 1 bundle! I visited Fort Worth Fabric Studios. I wonder how far of a drive it would be??? I would love to pop on over. Their Tonga Treats Lemonade.. OH MY!! Love it! I love the Memorized by Color bundle. So pretty, they really are wonderful at putting fabrics together! I really like Riley Blakes's Ombre Dots Fat Quarter bundle. Thanks for the lovely giveaway. I signed up to Fort Worth's newsletter, thanks. I love the Quiltcon challenge bundle. My daughter wants to remake her bedroom in a boho theme, and these colors would give me a great start. I just signed up for their newsletter. I love their online shop. I am a 30's NUT so for me I LOVE Once Upon a Storybook by Windham!! What's NOT to like? Loved the Vintage Kitchen bundle! Thanks for the opportunity to win some of these great fabrics! AND I did sign up for their newsletter! Thanks, again. I love all the dotty prints---all the colors are just dreamy!!! I signed up for the Fort Worth Newsletter. I love the Aqua/Red Bundle! Thanks for the great give-away! I like Robert Kaufman's "Perfectly Perched Chairs" !! I liked Fort Worth Fabric on Facebook. I signed up for the Newsletter. Thanks for the giveaway! The collection I love is Ombre Dots by Riley Blake. Thanks! I like Riley Blake Chevron! I like Fort Worth Fabric Studio on fb. Also receive the newsletter. I love the QuiltCon Challenge FQ bundle. I get the newsletter. Thanks. If I have to choose, I'm thinking Dandy Damask or French Lace. Yummy. Thanks. I "Liked" Fort Worth Fabric Studio on facebook. I love Joy by Kate Spain! I love Kona Solids right now so much!! Thanks for the chance to win! My favourite collection is the "Ombre Dots" bundle by Riley Blake. I liked the FWFS page on Facebook, too. The Alexander Henry novelties section has lots of fun stuff! I like FWFS on FB! Thanks for the chance to win! Moda's Vintage Modern is my fave. The bundle "I love a rainy day" is so cute. and the Ta Dots are wonderful too. thanks for the giveaway. I "Like" Fort Worth Fabric Studio on Facebook. My favorite is "Scoot" from Riley Blake. I'm loving the Vintage Modern by Moda. I "like" Fort Worth on Facebook. As I sit here and sip my liquid heaven there is absolutely no doubt in my mind..."All About Coffee" is my favorite! I can't "like" Fort Worth on FB today because I already "liked" Fort Worth months ago on FB! :o) I've been a newletter subscriber and a FB follower for awhile now...I LOVE Fort Worth... Anyways, just wanted you to know I already "like" you on FB. I LOVE: Joy By Moda! Christmas is coming! FAT QUARTER BUNDLE. I just love, love, love those colors together, and the prints are a perfect compliment to one another. I liked Fort Worth Fabric on Facebook! The Island Batiks is my choice of favorites. Yes, I 'liked' Fort Worth fabric Studio on FB! Love the Citrus Twist bundles. Liked their page on FB. Christmas Mix from Quilting Treasures - I can see the quilt already! Yummy bundles - my fav is Sorbet. Lovin all the dots there too! I love those cute four fat quarter mini-bundles and I really like the QuiltCon bundle. After making four QuiltCon blocks this weekend a coordinated set of fabrics looked good to me. I love apple Sauce FatQuarter Bundle. I already get their newsletter.Thanks for the chance!! I visited their website and would love a bundle of "Tonga Treats" in the Gelato colorway ... so pretty! I "liked" Fort Worth Fabric's on facebook. Have a wonderful day! I've liked them on fb! I must have Christmas on the brain- "Blitzen" by Moda. I LOVE Fort Worth Fabric Studio; have for years! I've ordered from them far more than I ever should've, or care to admit!! My fave bundle is "Back To School"~ perfect for this time of year! who doesn't "like" fort worth fabric studio on facebook??? not me!!! i just "liked" them!!! I love Ombre Dots by Riley Blake! I've been collecting yellows, blacks, greys. I love the Luminosity bundle. I "Like" Fort Worth Fabric Studio on Facebook! I signed up for the Ft Worth Fabric Studio Newsletter! Thanks! Catch of the Day by Timeless Treasures is super cute! Thanks for the chance to win. I like the 1930's Playtime but I like ALL fabric! I'm loving the jingle line by Robert Kaufman, and the Kona solids bundles. Sigh. Someday I will buy them all. Thanks. Liked their page of FB. Thanks. With Christmas around the corner I'm loving the Joy! Thanks. ... And now I have liked them on FB. Anything Alexander Henry. :) Thank you! Hmmm, still want to get my hands on a little Pezzy Print! I'm so loving Owl Be There ! I've liked Fort Worth on Facebook! The Sugar Hill Collection they have is nearly exactly what I have been looking for to make my daughter's first birthday dress! I love the citron and gray by Michael Millerb. Thnx.